It’shard to believe that summer is almost over. The summer veggies are winding down, the chill of fall will soon be in the air – BUT that doesn’t mean gardening season is over! Now is the time to plant your fall garden so you can keep the harvest coming during the fall and into the winter months. 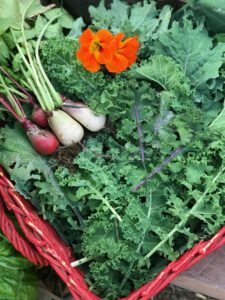 In this blog post, I am going to cover the basics of fall gardening, what it is, why you should grow one and how to get yours started as quickly and inexpensively as possible. What is a fall garden? A fall garden is simply a garden of cool weather loving vegetables. 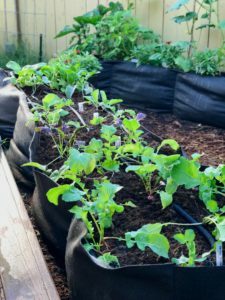 There are two types of vegetables: warm weather veggies that grow well in the warm summer days and nights, and cool weather vegetables that grow best in the cooler weather of spring and fall. The cool weather veggies like temperatures of 75 degree F or colder. Lettuce, greens, broccoli, peas, cabbage, radishes, carrots, and brussel sprouts love the cool weather and are ideal for a fall garden. If you’re concerned about your veggies getting frozen in the winter, there are many cool weather vegetables will survive and even thrive in frost conditions, such as root vegetables, lettuce, kale and other types of greens. You’ll love fall gardening, the weather is cooler, it’s more comfortable to work in the garden, and it’s wonderful to have the variety of cool weather vegetables in the kitchen! 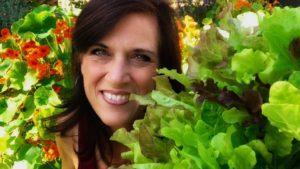 Why grow a fall garden? A simple plastic winter cover over your garden beds can help you extend your growing season for cool weather, frost tolerant veggies. Our goal as gardeners is to always have something to harvest, even through the cold winter months. 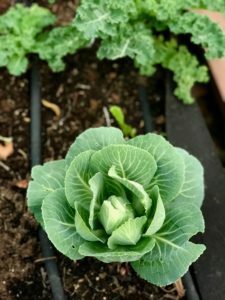 By starting seeds for your fall garden now, getting the veggies established before the cold weather hits, you will be harvesting well into the fall, and even into the winter months. Simple row covers can help you extend your growing season. Watch my video “Easy Winter Cover to Extend Growing Season” to see exactly how to make one for your garden bed. If you live in a southern climate, winter is an ideal time to grow your fall garden, and you likely won’t even need a winter cover on your garden beds. Make room for your fall garden by popping up a Smart Pots fabric long raised bed or container. Where to plant a fall garden? My garden is still full of summer vegetables. – the big problem is: where to plant? This problem is quickly solved – in a container! I am growing some of my fall veggies in a Smart Pots 8 foot long raised bed ( an extra 11 feet of growing space!) as well as in a regular raised bed, once my summer veggies are done. Smart Pots containers come in many different colors, shapes and sizes and are easy is easy to pop up, fill with soil, and put your plants in! I’ll also be covering my fall veggies with shade cloth to protect the them until the weather cools off here Southern California. Starting and growing a fall garden is easy and can be done very inexpensively. I love to start my fall garden from seed as opposed to purchasing transplants from the garden center. Starting from seed super inexpensive as compared to purchasing transplants. In additon, you get so many fun varieties that you’ll never find at your local garden center. Fall seedlings off to a quick start indoors under grow lights. I get off to a quick start with my fall garden by starting seeds in indoors in peat pellets on a heat mat using indoor grow lights. 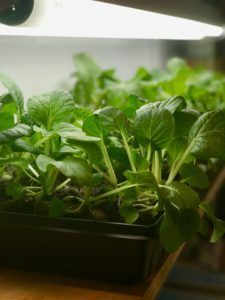 This provides a more controlled environment so that the seedlings grow stronger faster and I can get them outside in my garden as soon as possible. This also allows me to start cool weather veggies indoors when it is still too hot to grow them outside, saving me time. This way when it does cool down, I’l have transplants to put into the garden, which gets me harvesting those delicious fall vegetables quicker. My Fall Garden Seed Collection makes it easy for you to get your cool weather garden started. All varieties can be direct seeded in your garden, many can be started from seed indoors. Pick one up at calikimgardenandhome.com and grow the same veggies I am – it will be so fun to compare notes as our veggies grow and harvest together! 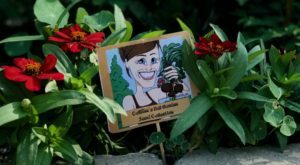 Watch the first video video from the Fall Garden Series on my YouTube channel, “Fall Garden – Starting Seeds with CaliKim and CameraGuy” for some garden fun and to see to get your seeds started! Stay tuned for more videos in the Fall Garden Series as we get our seedlings planted out in the garden. Subscribe to my YouTube channel and click the bell icon so you get notified whenever we post and update video! Comment below, let me know if you’re growing a FALL garden and what you are growing – I’d love to hear all about it – see you in the garden! Hello Kim, I live in the San Francisco area and I am still harvesting my tomatoes, beans, eggplants, amaranth. I am waiting to harvest my Chayote. I planted bush beans and watercress today. I am planting Kohlrabi soon. When is a good time to plan the yard long beans and sugar snap peas? Great video. I had a knee replacement in the end of July, so my summer garden fried. I am trying to get healed enough to plant my fall crop of seeds. What do you replace the nutrients with? Compost and/or fertilizer? We are still in the 90’s and all my soil is totally dry. I wasn’t able to do anything in the garden for the last 6 weeks, so it looks horrible. You make yours seem so easy. Can’t wait for your next video. Great video on fall planting. I live in Southern California, It’s still really hot here until November. When do you recommend transplanting for my area? Nice video on fall planting. I lived and planted in So. Calif for 50 years and the last 10 years in Indiana. I have planted my fall garden in the first 2 weeks in August. My garden class at the Boys And Girls Club of Zionsville are still super excited about the garden and your methods have inspired me to teach them. I am new to your YouTube channel and Blog and I love them both! I love gardening but haven’t done it in a few years so I’m so excited to find you! You have given me the encouragement to begin the journey again. I’m going to try to start a fall garden with your seeds and Ive also asked all my employees if they could keep their kitchen scraps for me because I’m going to try to make compost from your YouTube channel(truth be told, I’m nervously excited about it!!). I see you use 2 8ft smart pots(and extra space) Do you think two 6 ft smart pots will be enough? And can you estimate the amount of soil that Ill need? Thanks so much for your enthusiam? Great video, I’m excited to use the peat pellets….never knew. I’m going to plant them with my grandsons. Really enjoyed your video on YouTube. You were clear and concise covering just what we novices need to start our gardens. Bravo to you and your team. Came across your channel in the nick of time. I live in South Florida. Getting ready to focus more on my gardening. Just finished school earning my Bachelors. Thanks for all the great information .